By now, most of you know about my passion for handmade soap. That is why, when I learned about Brittany's charcoal soap I couldn't resist and asked her to participate in A Portrait of the Artist project. So here she is, today, in all her glory, revealing her dreams and goals to all of you, Brittany of Pro-Soap Propaganda! Hello! 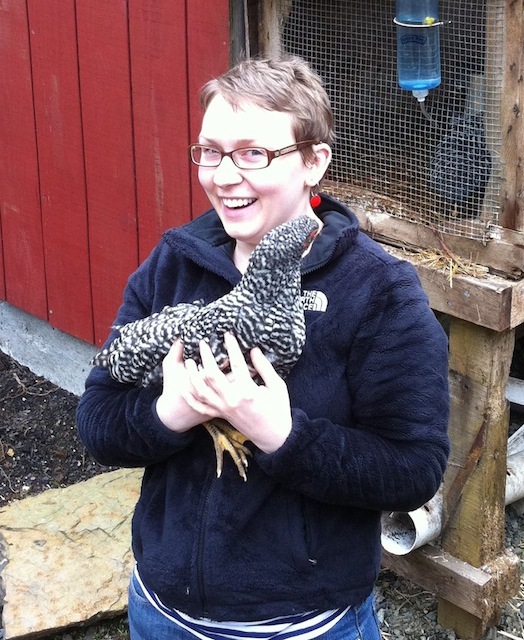 My name is Brittany and I am an Alaskan girl living in Oregon. I'm originally from Ketchikan, a small city located on Revillagigedo Island, the 12th largest island in the U.S. (That is your random fact of the day. :o) Despite the island's size, there is only about 36 miles of road on it. We also average about 12 feet of rain per year and are part of the lush Tongass National Forest. All of this rain and island-living could either mean horrific boredom to many people, but we fare well. My community is full of many artists and musicians and we love to play outside, even when it's raining sideways. (That just means more rain gear!) Unfortunately, I am not all that artistic and longed to have something to make with my own two hands. My chance to do this didn't happen until later, though. I have always been independent and wanting to do and make my own bath and body products, cleaning products, and the like, but there wasn't anyone in Ketchikan who was doing this. You are pro-soap. Why? How did you start making your soaps and when did you decide to start selling on etsy? Luckily, I ended up meeting a wonderful guy and moving to Portland, Oregon, with him in 2008. I worked as a receptionist and attended distance classes to finish up my degree in anthropology, but it finally occurred to me that, hey! Now that I live in Portland I can probably find someone to teach me to make soap! I looked online and found there was a business just a few miles from where I lived that offered soap classes. 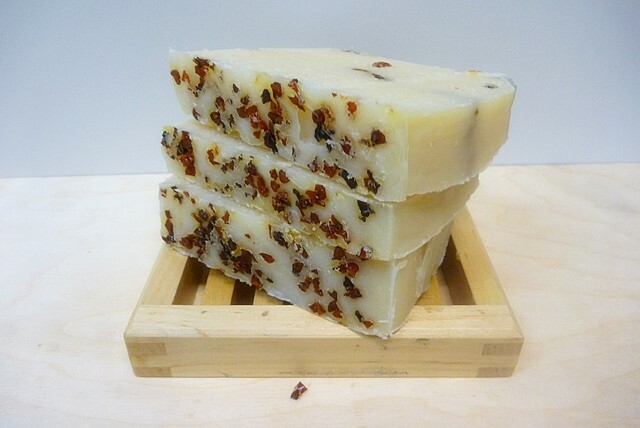 It cost $35 and I went home with two pounds of a delicious lemon-scented poppyseed soap (the prototype to my North Star soap!). I was HOOKED! I was finally able to make something myself that smelled like I wanted it to, looked like I wanted it to, and I knew exactly what was in it. I started making a bunch of soap that were all soaps that I, myself, would want to use. I started listing it online on Etsy and never looked back! Here is the most important question. 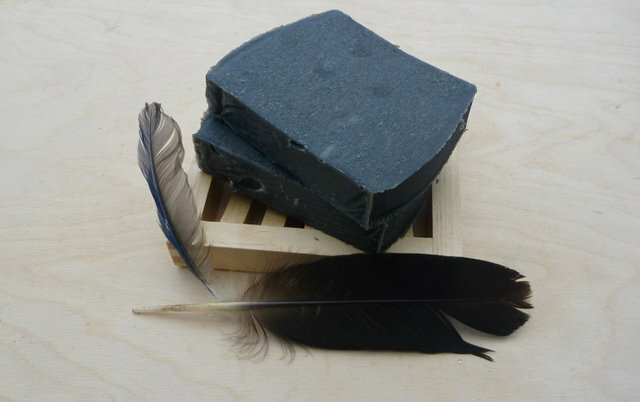 Tell us about your charcoal soap. Charcoal? Really?! I didn't know you could use it in a soap on your face. People, it is all black! Charcoal is sooo good for you! Activated charcoal helps clean out your pores and purge toxins from your skin. I remember reading something about how one teaspoon of activated charcoal, if you spread it all out in a single layer, would cover a football field. The charcoal bits are that teeny tiny! Charcoal attracts chemicals and gases to its surface. When it's in soap, it attracts impurities to itself and then it all gets washed away with water. I used my charcoal soap for months and my skin was looking SO much better (I usually have oily skin with clogged pores), but then I stopped using it because I had wrapped up all of the bars from my last batch and forgot to leave one out for myself. It wasn't a huge deal at first, but my skin is starting to look oily and breaking out again, so I'm going to have to start using my soap again! I learned my lesson! 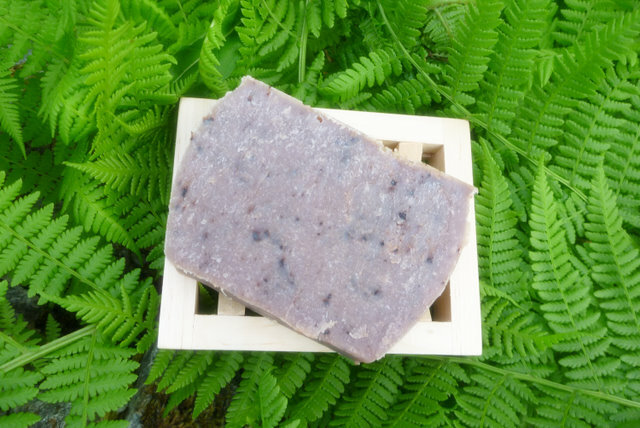 Is it easy to find organic ingredients for the production of your soaps? Surprisingly it is! Between local shops and eBay I am almost always able to find organic ingredients. I try and eat organic and healthy whenever I can and since skin is your largest organ, why wouldn't I want to make sure I was trying to give myself and others the best product possible? What led you to a more eco-conscious way of life or have you always led one? Did your parents require you to recycle or to save energy? I grew up living with my dad and, while we weren't poor by any means, we didn't seem to have a ton of extra money available either. My dad also is extremely gifted at being able to fix almost anything and always wanted me to know how to do things myself. That way of thinking always made me think about how my actions cause reactions. There was no recycling in Ketchikan when I was younger, because it was very expensive to ship garbage off the island. Also, because we did live on an island that was only accessible by boat or plane, sometimes in horrible weather you couldn't rely on a boat or plane being able to make it to port or to land, so you learned to make do with what was around you. As far as I can remember, we only seemed to buy stuff when we had wore other things out and my dad still has articles of clothing, household items, and tools that were his dad's and he still uses them and I imagine I'll probably get them someday! Something that I realize I do is not keep too firm of a grip on my belongings. Items flow into my life and then sometimes they leave. I don't have too much extra money, but if I am going to buy something I'm going to buy the best thing I can of it so that it will hopefully last me as long as possible. However, sometimes life situations change and things must go so that other things that may get used can take their place. For example, several years ago, when I was still living in Alaska where the weather is much more violent than it is in Oregon, I bought an expensive North Face parka that is windproof and waterproof. I loved that jacket! However, I moved to Oregon and held onto the jacket, thinking that I may use it again sometime. Several years passed and during this time I began to get more into minimalism and wanted to go through my things and get rid of items I thought other people could use. It was a tough decision to get rid of the jacket, since I had some good memories with me wearing it, but since I was not wearing it I knew it needed to leave. I bought a different jacket that was similar, but much more fitting of my present lifestyle and should last me quite a long time! I guess what I'm trying to get at is that my dad taught me to take care of my things and to buy things that will last me a long time, but if something doesn't work for you anymore, there is no reason to hold onto it while it's still a useful item that someone else can use! Too many times I would look over certain things and think about the memories that I had associated with these items, but I will still have the memories even if I don't own the items anymore! It's definitely hard to get rid of things sometimes, but I'm so much happier afterward. I am not a huge consumer, don't like to go shopping, and try and DIY as much as I can. Life is so much more fun and interesting that way! As we can see by the name of your blog, you re also pro-soup. Does that mean that you are food-conscious and are off pre-fabricated meals? Oh, goodness, YES! I love food! I love cooking food and all aspects of it. The food I make isn't "fancy" by any means, but it is totally delicious. Soup is really easy to make and there are about one billion types (give or take! ), so I could happily make a different soup every day for a year. I love to use local ingredients as much as possible and there is always salmon and other seafood in my life! I am always loving to find new, healthy recipes to try out, so if anyone has any favorites, please feel free to send them my way! I also love to make Indian food, because I love that it is so vegetable-centric and so yummy with all the different spices! Now let us in on the most exciting part, in your etsy profile you mention that a percentage of the soap sales goes to funding your Antarctica/South America trip planned for February 2013. Why should people feel excited about this cause? Will you get a secret ingredient from the penguins? People should be excited about this because I will be living out one of my life-long dreams and they have the chance to help me save to get there! I have ALWAYS wanted to go to Antarctica, but it never seemed like a true possibility until it finally clicked into my head one day that WHY did I think it was not possible? I am finally at a point in my life where it can happen! My boyfriend and I do not plan on having children and I am just about done with school, so why not start saving for something big? My original plan was to just go to Antarctica, but after some thought I realized that if I was going to go all that way, why not do a little bit of touring around South America, as well? It's another place I've always wanted to go, so make it happen, Brittany! Mwah ha ha ha ha...... Is there a special "botanical advantage" to penguin poo? Does it give one a youthful glow? Is it the secret to never-ending youth? I promise to research this by the time I get there and will collect the most fresh samples possible to use in the most high quality soap ever. Gosh! I hope in five years' time that I am selling my soaps in some local stores and that my Etsy shop has picked up and I have some daily sales. It's hard trying to sell a product that there are so many other great versions of, but I believe in myself and my yummy soaps and the other products I hope to bring into the shop someday! I guess that's all I can really do, is feel positive and keep on trucking, right? I love love love my friend Brooke's bags, purses, and pouches! I have this purse in a different fabric and I use it pretty much every day! Her purses are stylish and water resistant. I also use one of her wallets. She does a great job and I love telling people about her items because I am a hard user of things and her pieces stand up to whatever I throw at them. Oh, me too! The soap looks quite awesome! What a fantastic interview, Sonya! It is so much fun to meet people who are so enthusiatic about what they do! Good luck to you, Brittany with all your projects!! Oh, thank you, Laurie! I think Brittany is a person to remember. She is quite the dreamer (and the doer, actually)! Aw, shucks! *scuffs dirt with toe* ;o) Thank you! Love the ProSoap shop! It's all vegan and it all looks amazing! Thank you for dropping by! The Pro-Soap creator is fascinating and no wonder she creates such lovely soaps! Really?! What a spectacular moment! It is a small world, after all, even though it is practically endless... Thank you for sharing this moment with us, Annie! I think I will remember your story for quite some time! There is nothing accidental, after all! Hi! Oh, my gosh, you just reminded me to go through my latest batch of Twitter followers and see who is/isn't a robot. ;o) Nice to meet you!! Just followed back. So you just moved to Portland? Well, it has been a tiny bit less than a year, but you know how it goes! Takes a while to find the village. And I guess in this case thank goodness for blogs and twitter! For the first second I thought you were saying that you have followed me on Twitter for a tiny bit less than a year and my first thought was, "I am a JERK!" but then I realized what you meant, lol. ;o) Yay! Welcome! Brittany, you have such wonderful plans, I am in awe of soap makers , loved the interveiw!! Great article as always! I have super sensitive skin so I have never tried handmade soap. My husband uses it and LOVES it. We have a local person who he purchases it from. 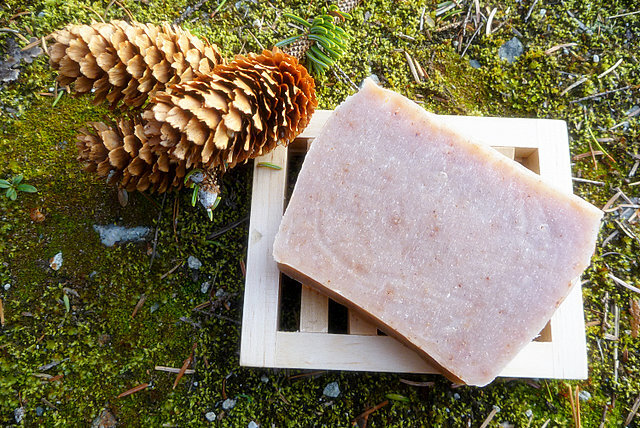 He says it lasts so much longer than store-bought soap and that it has such a great smell! Oh, I am sure you have to try handmade soap! Nice article! I love handmade soap. Great interview. All of Brittany's soap sounds wonderful. I hope she collects all the money she needs for her tip to Antarctica. It sounds like it will be a wonderful adventure. I thoroughly enjoyed the article. Like most people, I love the look and scent of all kinds of specialty soap. (particularly vegan!) While going through the pictures, I thought I could almost smell the different soaps. LOL. Good job! Brittany! Thank you so much for the Salty plug. That was so sweet. You guys are all right, Brittany is an awesome person with really fantastic plans. I'm also an advocate of her soaps. Our whole family loves them and we all smell extra good because of it! Ps- I followed my Etsy views to this blog and I'm really impressed- just left some small house feedback on another post. I'll be following this one from now on.